'Wind Singer' (Anna and David Cadd, R. 2006). Seedling #45-92-11. BB, 26" (66 cm), Midseason bloom. Standards and style arms deep golden yellow; light raspberry midribs on Standards; Falls white raspberry plicata, darker markings on edges and shoulders, narrow raspberry border, neon wash in center, lighter around beard; beards deep yellow tipped raspberry; pronounced sweet fragrance; purple marks on stalk. 'Needlepoint' X 'Shenanigan'. Cadd's Beehive 2006. From AIS Bulletin #341 April 2006 Introducing Wind Singer: (Cadds 2006). BB. 26" (68 em.). Medium. Standards and style arms are deep gold yellow with the light raspberry line in midrib. Falls are fancy white raspberry plicata with darker markings on edges and shoulders and 1/4" to 1/3" raspberry border; with neon flush in center of falls, lighter around the deep yellow beard, tipped lavender. Purple markings on stocks. Strong, sweet fragrance. Good grower with nice branching and 6-7 buds. Needlepoint x Shenanigan Sdlg: 45-92-11. $15.00. 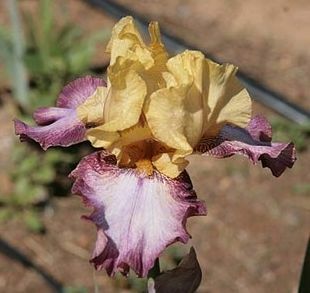 Cadd's Beehaive Iris Garden.